Cookies have been massively baked this whole week. I thought I would be close to get my Christmas baking done, but every time when the cookies are out of the oven, they smell so good that we can't help but eat them. Until today, more than half of the cookies have already been eaten before I have a chance to gift wrap and send them to friends. I guess there will still be another week of baking to do until I can sit back and relax. Good that I enjoy baking. All these colorful cookies get me into the Christmas spirit. I came across a website called 'Joy of Baking'. There are so many marvelous recipes on that site. I tried this Thumbprint Cookie recipe, and I really like it. I also used the same dough recipe, and made a different kind of cookie which I called it Cherry Shortbread. All the cookies came out beautifully. Line a baking sheet with parchment paper or reusable non-adherent silicone baking mat. In a bowl of a stand mixer, using a flat paddle attachment, beat butter and sugar until light and fluffy for 2 to 3 minutes. Add the egg yolk and vanilla extract and beat until combined. In a separate bowl, mix flour and salt together. Add the flour mixture to the batter and beat until combined. Chill the dough for 30 to 60 minutes if it's too soft to roll into balls. Place the chopped nuts on a plate. Roll the dough into 1" balls. Dip the balls into the egg white one at a time, and then roll in the nuts. Place the balls 1" apart on the baking sheet. Using the thumb to make an indentation into the center of each cookie. Fill with about 1/2 teaspoon of jam. Bake for 12 - 15 minutes or until the cookies are nicely browned. In a bowl of a stand mixer, using a flat paddle attachment, beat butter and sugar until light and fluffy for 2 to minutes. Add the egg yolk and vanilla extract and beat until combined. Add chopped maraschino cherries to the mixture. Mix well. Roll the dough into a 2" diameter log. Chill the dough for 30 to 60 minutes if it's too soft to roll into a log. Brush the log with the beaten egg white. Roll in the chopped nuts. Cut the log into slices about 1/4" thick. Place the slices 1" apart on the baking sheet. 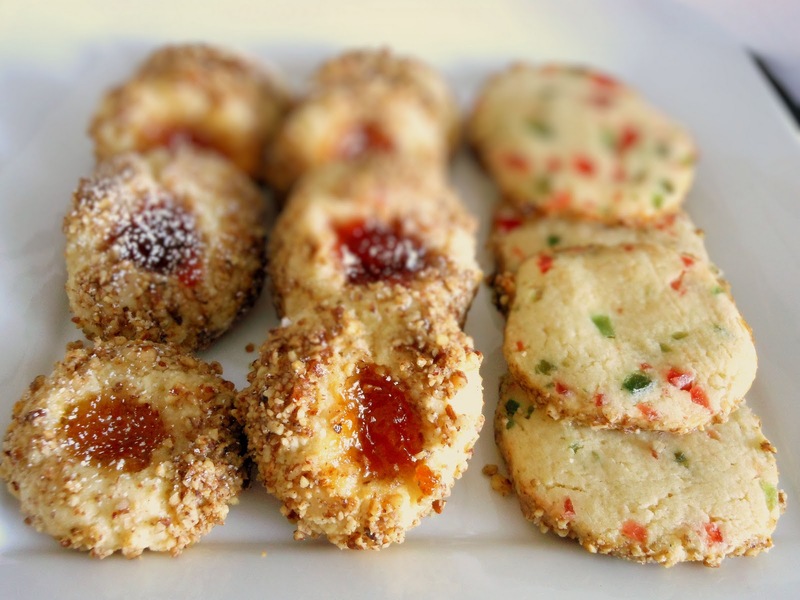 Wah beautiful thumbprint cookies! I don't bake often but looking at these cookies make me want to bake some! My new year resolution can be in danger very quickly by blog hopping! lol. Thank you, Nami! You are in good shape. You definitely don't look like you will be in danger. ;-) Love your Pork chop recipe!